The new Nintendo hardware will be something custom built for emerging markets, not "a cheaper version of what we currently have." Nintendo big boss Satoru Iwata has told Bloomberg in an exclusive interview that his company aims to release new devices for emerging markets as early as next year. Before you start thinking it'll be a 2DS or Wii-Mini kind of deal, Iwata specifically stated "We want to make new things, with new thinking rather than a cheaper version of what we currently have." "The product and price balance must be made from scratch," he added. Furthermore, Nintendo is also planning to boost the use of characters such as Mario by offering figurines that will allow the transfer of game information between devices through near field communications, in a similar way to the Skylanders or Disney Infinity franchises. But, don't expect this as an admission that Nintendo will enter the smartphone business, as Iwata once again reiterated that Nintendo smartphone games is a line the company will not cross. "Our games such as Mario and Zelda are designed for our game machines so if we transfer them into smartphones as they are, customers won't be satisfied," said Iwata. "If customers aren't satisfied with the experience, it will decrease the value of our content." Iwata said that the upcoming Mario Kart 8 will, however, had a form of connectivity with a smartphone app, allowing users to track progress and watch videos of games played by friends. 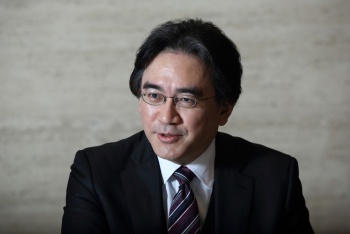 As for the "new hardware for emerging markets," Iwata was quite slim on details, but said that more information will be released at the E3 trade show in Los Angeles in June. Earlier this week, Nintendo posted a massive $455 million loss, but still has high hopes for next year. Perhaps these new devices are why?